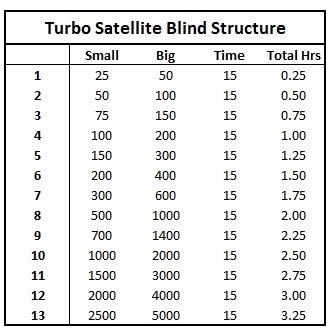 In order to allow more players an opportunity to play in our High Stakes tournament which will be held on October 13th, we are going to host an evening of “Turbo” single-table sit-and-go satellites on September 28th in Greg’s Room. These will differ from our usual tournaments in that we will be using a “Turbo” style blind structure with reduced chips. Each tournament is designed to be over in approximately two hours, which will allow more than one (hopefully three or four) tournaments to be held that evening. If you bust from your first tournament, buy-in again and you can be playing as soon as there are ten players available to start another tournament. Friday, September 28th at 7:00pm. Greg’s house. Email me for the address information. 7:00pm we will start buying players in. Single-Table Tournament – play will begin when ten players have bought in. Further tournaments will be started as soon as ten players are available. Concurrent tournaments will be happening on different tables. T2,000 tournament. 15 minute blinds. Modified Turbo blind structure. Please check in at the blog to see league news, standings and house rules. I am interested in playing Where will the game be held and also what is the buy in ?